The Private Secretary TV show was a 30 minute comedy series on CBS about a female secretary who worked for a suave bachelor talent agent. She constantly found herself getting involved in his relationships with his female companions. Typically, she would really mess things up and then spend the rest of the show trying to put things back together again. Private Secretary was not Ann Sothern's last TV series. She went on to star on the series, "The Ann Sothern Show", which ran for three seasons and 93 episodes! 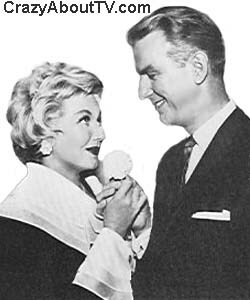 Several of the Private Secretary Cast also starred with Ann on the Ann Sothern Show! Don Porter ("Gidget"), Jesse White, and Ann Tyrrell were all major characters on both series! Ann set a record on the Private Secretary TV show by becoming the first working woman on a U.S. TV sitcom! As a compliment to that record, Ann had already played the part of a "working girl" secretary on the "Adventures of Maisie Radio Show" for 7 1/2 years! Although you never saw her, you may have heard Ann's voice if you ever saw the series, "My Mother the Car". Ann provided the voice of the mother, Gladys Crabtree on that show! Ann Sothern was nominated for Emmys in 1955, 56, and 57 for her performances on Private Secretary. In 1955, Loretta Young won for the "Letter To Loretta" TV show. In 1956, Lucille Ball won for the "I Love Lucy Show". In 1957, Nanette Fabray won for "Caesar's Hour". In a nearly unheard of stroke of co-operation between networks, NBC aired Private Secretary epiosdes during the summers of 1953 and 54! They ran the same episodes that CBS had just aired during the seasons immediately preceding those summers! Thank you for visiting our Private Secretary TV show page!